The MolE PhD program does not require students to have a degree in a particular discipline, but does require the student hold a BS or BA degree from an engineering or natural sciences program. The MolE PhD program accepts students with diverse backgrounds in engineering, science, or medicine, helping match their research interests with Institute faculty from departments in the College of Arts & Sciences, the School of Medicine, the College of Engineering, and the School of Pharmacy. Possess a BS or BA degree from an engineering or natural sciences discipline. Have passed (or will have passed by the time you start the MolE PhD) at least one course in Thermodynamics or Statistical Mechanics (or a course with comparable topic coverage). Acceptable courses include standard classroom courses at your college or university, as well as “massive open online courses” (MOOC) such as offered by Coursera and other providers. If this course is taken during or after application submission, please indicate this within your application. The admissions committee will consider this current or future course enrollment when making admissions decisions. Note: Non Native Speakers of English must satisfy the English Language Proficiency requirement in one of two ways. Either hold a bachelor’s degree from an accredited institution in the United States (Note: A master’s degree does not satisfy this requirement), or score at least a cumulative 92 on the TOEFL (with at least 26 of the points earned specifically from the speaking section). Additional evidence of English proficiency, such as high GRE verbal and analytical writing scores will strengthen the application, as will evidence of ability to carry out independent research. We refer to Memo 15 for more specifics of the Graduate School English language proficiency requirements. January 7th – Applicants urged to have submitted all required materials. Late applications will be processed if complete, but are at a disadvantage. Mid-January – Application review begins and continues, usually until late-March. Offers are made on a rolling basis as top applicants are identified. If your request is not based on financial need, eligibility for having your application fee paid by the MolE PhD program requires an email to moleng@uw.edu requesting consideration. Information within the email should include a short (less than one page) description of the circumstances warranting a fee payment, as well as a copy of your CV. MolE application fee payment decisions are made on a rolling basis as top applicants are identified, and these payments are limited in quantity each year. Additional information may be requested from you in order to better process your request. If your need is based on your financial situation, “financial need” fee waivers are available directly from the UW Graduate School. Need is determined for applicants who meet Washington Student Achievement Council eligibility requirements for the Washington State Need Grant Program in the most recent tax year preceding the application. The Graduate School currently bases waivers on the 70% Median Family Income (MFI) level. Graduate School issued fee waiver requests must be submitted in the online admission application after all steps of the application have been completed and at least 7 calendar days prior to the program’s posted application deadline. 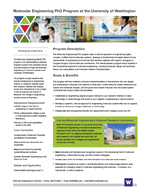 Funding is primarily provided to PhD students via Research and/or Teaching Assistantships. The RA/TA Appointment includes a competitive stipend (the stipend rate for the 2018-2019 academic year is $33,540), tuition coverage, and insurance benefits (medical/dental/vision). With rare exception, international and domestic PhD students are funded for the first 3 academic quarters by the MolES Institute and thereafter by the student’s Principal Investigator (PI). Specific funding mechanisms will be defined in the offer letter. Yes, funding and benefits are the same for both US citizens, as well as International/Non-US Citizens. The UW is also strongly in support of applicants who are part of the Deferred Action for Childhood Arrivals (DACA) program. Applications are only accepted online, and are completed via the University of Washington Graduate Admissions site. If you have not already done so, create a Login ID and password. Follow the application instructions through the Graduate School web site. Online recommendations: Type in the 3 recommender’s names. Make sure you have selected “Online.” Once you submit the names, your recommenders will receive an automatic email telling them which web site to go to for uploading or copy-and-pasting the recommendation(s). After they have submitted the recommendation, you will then receive an email stating that the recommendation process has been completed. You can monitor the status of each recommendation on the application web site. You must upload your unofficial transcripts into the application. We do not accept paper transcripts. Upload your statement of purpose. Complete the online process by paying the application fee using your credit or debit card and submitting the on-line application. You will then receive payment confirmation. GRE scores should be sent directly from the Educational Testing Service to the Office of Graduate Admissions: (Use UW GRE code = 4854 only.) Please request registration forms or previous score reports from the Educational Testing Service (http://www.ets.org). Scores must be less than 5 years old. TOEFL (Test of English as a Foreign Language) – Please see University of Washington Graduate Admissions website for details. Only official TOEFL scores may be submitted. Questions? Contact the MolE PhD Academic Advisor.